It takes a lot of empathy and compassion to help families plan a funeral and traverse the grieving process. But Rob Gaskill is up to the task. Gaskill, owner of Estacada Funeral Chapel, began working in the industry not long after graduating from high school. He's worked in Estacada since 2002 and noted that the funeral chapel will celebrate its 100th anniversary this year. Gaskill has always been interested in medicine and helping others, but claims he wasn't smart enough to be a doctor or counselor. 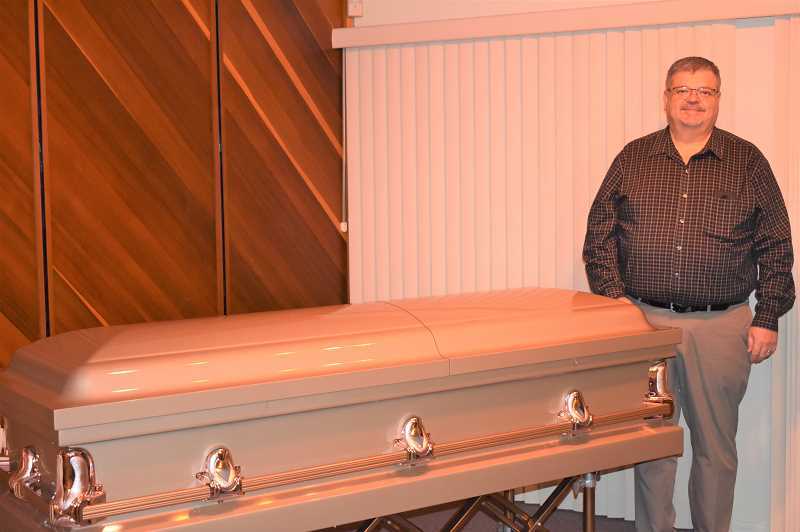 When he was 16, a friend joked that he should be a mortician, so he went to Bateman Carroll Funeral Home in Gresham and "started asking questions." "I went back there two weeks later with more questions," he added. One month after graduating from Sam Barlow High School in Gresham, Gaskill began his career with an apprenticeship at Macy and Son Funeral Directors in McMinnville. He lived in an apartment in the funeral home that was next to the embalming room — which contained five bodies on his first night there. "I called my mom and said 'I don't know if I can make it.' My mom told me to give it two weeks," he recalled. "Almost 35 years later, here I am." When Gaskill completed his training at 19, he was the youngest licensed funeral director in Oregon. Today, he wears many hats. A licensed funeral services practitioner and a licensed embalmer, he handles pre-need planning, embalming, services and many other elements of the process. There is also a lot of paperwork associated with his job. "My day can change at a moment's notice if I have to pick up a body," he said. "Some days I'm folding 150 memorial folders. Other days I'm doing makeup and hair on a deceased person." Gaskill appreciates being able to help people during difficult times in their lives. He noted that the most rewarding part of his work is "when someone walks in scared and they leave and (say) 'that wasn't so hard after all.'" "The family needs one person not grieving with them to walk them through the process, and that's my job," he said. Gaskill has developed several techniques for helping families, including asking direct questions rather than open ended ones when planning for a service. For example, "Do you want to do a burial or cremation?" is a more effective question than "What do you want to do for your mom?" His goal is also to empower families he works with, noting that he wants them to think "I made good decisions," as opposed to "Rob made all the decisions for me." Gaskill added that each family has unique needs. "Everyone grieves differently for different reasons. You can't judge based on (the deceased's) age or cause of death," he said. Gaskill also does marriage coaching, which he said his job has prepared him well for. "I have a lot of techniques I use to talk to people in grief, listen to what their needs are and being able to walk them through that," he said. Gaskill's work does not fit into a traditional 9 a.m. to 5 p.m. schedule — if a person dies at night, Gaskill is in charge of picking up the body at that time. "It's a 24/7 job. My next day off is in March," he said. Though it's not always an easy job, Gaskill remains energized because he appreciates working with people. "My greatest love in life is people," he said. "I take a week off and come back refreshed and ready to do it again for the next year." He praised his family for supporting his work. "It takes a very patient wife to be out to dinner, and then I've got to leave to pick up a body. Kary is an amazing wife," he said. Though there have been misconceptions about those who work in the funeral industry, Gaskills said they've lessened over the years. "We're not all a bunch of morbid people who prey on people's finances," he said. Since he started in the industry, Gaskill noted that cremation rates have risen from 20 percent to more than 70 percent. Green burial and green cremation are also rising in popularity. Gaskill appreciates working with these additional options. "I love helping people design a service that helps them celebrate the uniqueness of their loved one," he said. "From Rock of Ages to rock 'n' roll, I'm here to serve all needs." When he isn't working, Gaskill enjoys spending time in Estacada. He's the chairman of the Downtown Estacada Commission and plays trivia at The Cazadero, with the team The Undertaker and Friends. He appreciates building relationships with people. "I love serving people at the worst time of their lives. It's such an honor," he said. "In a small town it's harder because you know so many people. You serve your friends and family, which can be difficult, but I wouldn't have it any other way." From Friday, Feb. 15, though Thursday, Feb. 21, a replica of President Abraham Lincoln's casket will be on display at Estacada Funeral Chapel, 110 First Ave. The casket will be free to look at, and Gaskill is excited to connect Estacada residents to a piece of the country's history. "What a great thing to celebrate the 100th anniversary of this funeral home and see how things were done back then," he said.